The gigantic sunspot in the upper left of this image is about 50,000 miles (80,000 km) long and was observed on the sun by NASA's Solar Dynamics Observatory on Nov. 3, 2011. 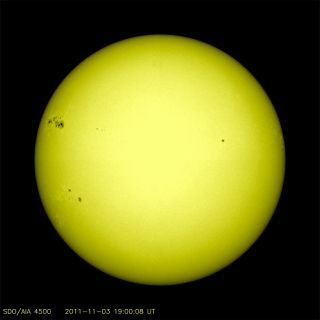 The massive sunspot, called AR1339, is about 50,000 miles (80,000 km) long, and 25,000 miles (40,000 km) wide, reports SpaceWeather.com. For comparison, Earth itself is only 8,000 miles (12,800 km) wide. The sunspot behemoth isn't yet facing our planet, but was spotted today (Nov. 3) by NASA's Solar Dynamics Observatory (SDO) satellite. The spacecraft's photos of the giant sunspot show the solar region as it comes into view on the northeastern edge, or limb, of the sun. Sunspots appear when intense magnetic activity ramps up on the sun, blocking the flow of heat through the process of convection, which causes areas of the sun's surface to cool down. These isolated areas then appear dimmer than the surrounding area, creating a dark spot.